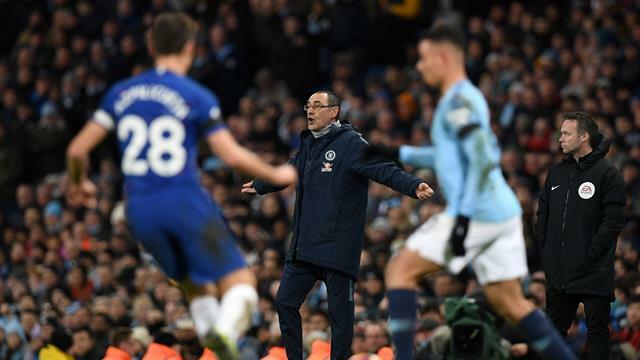 Was 6-0 at City the fault of Sarriball? No, says, Maurizio: “I didn't see my football.” And that's the main part of the problem, writes Dan Levene. During half-time at The Etihad, those Chelsea fans who had not already made their way home had the finest of straws at which to clutch. Whereas 4-0 at Bournemouth a fortnight ago may have been their worst Premier League defeat in 23 years; as it stood, this was only Chelsea's worst defeat in a fortnight. That positive was, of course, lost before full time: 6-0, and the very worst humiliation in the recent history of the club was complete. Sarri didn't even have a handshake for the man who triumphed over him. There are still those who stick-up for Sarriball – though you'll not find many of them following Chelsea away, it seems. One such correspondent dreamily vouched for the 'dreamer' in the dugout, post-match, over the 'brainless short-termism' of Chelsea's hire and fire policy. But that 'brainless short-termism' has brought 15 trophies in 15 seasons; and all that this dreaming has produced is dull football, of declining quality, and results that are no better than that. But there is a feeling this wheel has turned full circle once more. “An experiment which has failed,” is how many were looking it. The names of Andre Villas-Boas and Luiz Felipe Scolari (sacked ten years and one day before this) kept cropping-up. Is Sarriball to blame? Yes, and no. There are still questions about whether such a system can work in the Premier League. And the evidence here, in the form of the ugliest football played by Chelsea in decades, is not persuasive. But, if it were only down to the raw ingredients of Sarriball, in lab conditions, maybe the answer would actually be... well, 'maybe'. The issue here is the inflexibility of the model, as displayed by its inventor. Even amid this horror show, the shape was the same. The subs were predictable (except Mateo Kovacic came on for Ross Barkley about 10 minutes earlier than expected). And the lack of a Plan B was utterly as expected. In fact, there probably is a Plan B there somewhere: the problem, for Sarri, is that he's about 5ft 6ins tall, and goes by the name of 'Gianfranco Zola'. Add to that the continued insistence on playing N'Golo Kante, likely to be this club's only world-class individual next season, out of position: and it looks like he's making a rod for his own back. We are now more than six competitive months into his Chelsea reign: more than long enough for any manager to communicate any style of play to any group of players. At some point that ceases to be a failure of the players; and starts to become a failure of the man tutoring them. Right here, it looks like that point was passed some time ago. Chelsea are going backwards under Sarri. And the worry is that, after these last couple of defeats, his own reputation with both fans and players is starting to look beyond rescue. When this experiment began, both groups were faced by a dreamer with no proven route to success. They had a choice, back then, of whether or not to buy into those dreams. Now they have increasing evidence that the experiment is flawed; that the football cannot work. Asked if they will buy into the ensuing nightmare, it seems only one answer will be possible.